Mr. James E. Noles, age 81, of Pegram went to be with his heavenly father Saturday, February 2, 2019. He was born February 22, 1937 in Buena Vista, TN to the late James and Gertie Noles. James is also preceded in death by his siblings, Edward Noles, Danny Noles and Wilma Kilmon. James never met a stranger and is remembered as a fun loving, all out, good guy. He loved the Lord with all his might and is sitting, safely at the feet of Jesus. James enjoyed fishing, camping, and spending time on the water. 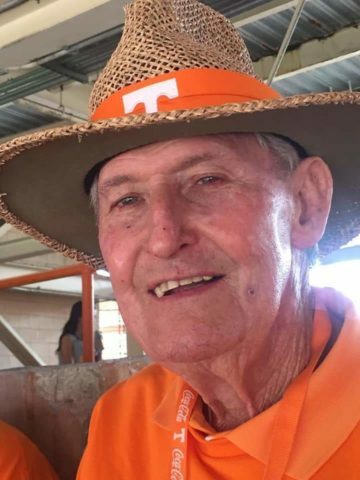 He loved working in the garden and his family remembers him as being a huge Tennessee Vols fan. James was drafted into the US Army as a young man and served his country with honor. He worked for over 38 years at the Ford Glass Plant. Starting in maintenance and working his way up to a supervisor position. He was proud to be a Mason at the West Nashville/Bellevue Lodge 716 and was also a Shriner. James is survived by his wife of 61 years, Carolyn Noles; son, James “Jimmy” Noles; daughter, Kimberly Noles, grandchildren, Logan, Ryan, Lainey and Katie Noles; and sister, Judy and John Czachowski. The family will receive friends from 5 – 8 pm Wednesday, February 6th and from 10:30 – 11:30 am Thursday, February 7th at Harpeth Hills Funeral Home. A life celebration service will be held at 11:30 am Thursday at Harpeth Hills Funeral Home with Brother Leon Edwards and Brother Adam Pace officiating. Interment will follow in the garden of Sermon on the Mount at Harpeth Hills Memory Gardens. Mr. Eugene always had a positive attitude and sweet smile on his face. I always felt good after I was around him . His gift was to spread sweet friendliness I will miss him as so many others will as well. My love to his family and friends!! Eugene will be missed by all who knew him. I am an older first cousin so I knew him all of his life. I loved spending time in Buena Vista with Eugene and his parents and siblings. I know that in heaven, he had a big welcoming committee!!!! Condolences and prayers to the Noles family! Carolyn, Jimmy and Kim. Met Jimmy in 1985 when I started work at the Glass Plant. The best person you could ever meet. Will miss his friendly spirit and leadership. What a wonderful tribute to an amazing man! My life is richer for having known Mr. Noles. Undoubtedly one of the nicest men I have ever known. God bless and comfort the family and friends! Our deepest sympathy to Carolyn and all your family. Eugene was truly a genuinely good man who loved his family & friends. He served our country for which we are thankful. May God comfort & strengthen you at this most difficult time. Love you all. I remember him when I worked at Auto Glass Fed. CU back in the 80’s. Him coming in always with a smile on his face. The last time I seen him was at Harvest Fields Baptist Church. My thoughts and prayers are with the family. So sorry to learn of Jimmy’s passing! I really enjoyed working with him at Ford! He was a fine man of character and principle who made the world a better place!! My thoughts and prayers are with the Noles family!